Wikipedia disables editing for Rep. Joe Wilson's entry, citing "vandalism"
(CNN) -- Two words, delivered with index finger punctuating the air and directed at the president of the United States, made a little-known South Carolina congressman one of the most controversial men on the Internet -- at least Wednesday heading into Thursday. 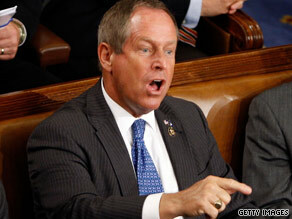 Many Facebook and Twitter users condemned Rep. Joe Wilson for his outburst toward President Obama. As soon as Rep. Joe Wilson was identified as the person whose angry and audible outburst disrupted President Obama's health care speech to Congress, condemnation was swift -- and brutal. "He is a [expletive] that called the president of the United States a liar on national television and has no respect for the office he holds." When the Web site scrubbed the sentence, an even more offensive entry wormed its way in. iReport.com: "You are disrespectful, sir"
Soon, the site disabled edit options for Wilson's entry, chalking it up to "vandalism." On Twitter, post after post urged users to condemn Wilson's breach of protocol, listing his Web site address and his congressional office phone number. iReport.com: What did you think of Wilson's outburst? Web surfers who visited http://www.joewilson.house.gov/ were greeted with the message: "This site is down for maintenance. Please check back again soon." Those who called his office number either could not get through because the line was busy, or could not leave a message because the phone continued to ring without activating voice mail. "If he's the face of the GOP, we'll have public option by Columbus Day!" wrote Andisheh Nouraee, a columnist for Creative Loafing, an alternative weekly in Atlanta, Georgia. Democrats on Capitol Hill piled on the condemnation as well. "Biggest disappointment of evening, the total lack of respect show by one member for the president," wrote Sen. Claire McCaskill of Missouri. "Never acceptable to behave like a jerk." As "Joe Wilson" trended on Twitter as the most popular conversation topic -- and on Google among the most searched terms -- the lawmaker's supporters fought back. Many set up Twitter accounts and posted their first tweets Wednesday night and early Thursday. "You have nothing to apologize for. You should be applauded for standing up and speaking the truth," said Jamie Sawyer of Madison, Wisconsin. "Good for him! Too bad he had to apologize" was a comment on the Lonely Conservative blog. "At last the little man found his voice tonight and called Obama what he surely is, a liar," said another blog, Sunlit Uplands. By early Thursday, genuine tweets about Wilson were interspersed with ads for male erectile dysfunction: "Joe Wilson Cialis $1.9 Viagra $1.1 (Web site address)"
"Happy Labor Day! Wonderful parade at Chapin, many people called out to oppose Obamacare which I assured them would be relayed tomorrow to DC," the tweet from Wilson's account said. On Facebook, where users aren't impeded by Twitter's 140-character limitation, a prolonged and nasty war of words dominated Wilson's page. "I have no problem being called a liberal hack by illogical, fear filled, unintelligent people. and actually, I will take it as a complement," wrote Janine Feczko. Name-calling was met by ad hominem attacks: "Janine, I'm sure in the trailer park where you live they gush over your incredible intellect and witty commentary. After all that toothless grin and tripple chin screams Harvard Law," wrote Dan Colgan. Nine hundred and 10 comments later, the battle raged on early Thursday. Amid all this, the campaign of Democrat Rob Miller, who hopes to unseat the Republican Wilson in next year's midterm elections, raked in the dough: more than $200,000 from 5,000 individuals overnight and Thursday morning after Obama's speech, according to the Democratic Congressional Campaign Committee. Finally, there were those who found humor in Wilson's heckle. A hastily created Web site, JoeWilsonIsYourPreExistingCondition, hurled a new insult at the politician with every click of the refresh button. "Joe Wilson poured salt on your lawn," said one. Refresh. "Joe Wilson traded the dead batteries in walkman for the fresh ones in your TV remote." Refresh. "Joe Wilson yells 'Freebird' at concerts." Not everyone, however, was busy assigning blame to Wilson. Los Angeles actor and comic Paul Scheer decided to shoulder it. "I apologize 4 yelling 'liar' during Obama's speech," he jokingly wrote. "Sen McCain ate my Kit Kat while I was in the bathroom & he pretended like he didn't." All About Barack Obama • Twitter Inc.